New business, PR for Anyone™, teaches easy to implement formulas and timesaving techniques to help small businesses be successful in gaining media exposure. PR for Anyone™, a new small business resource providing tips, products, and how-to interviews with the media (including television producers, magazine editors, newspaper reporters, PR pros and more) to teach business owners how to easily and effectively generate their own publicity is launched by Christina Daves, serial entrepreneur, award-winning inventor, speaker, and author. After launching a new small business, CastMedic Designs, Daves had no resources for PR, so she taught herself everything she could about the industry. In less than one year, she appeared in over 50 media outlets including the Steve Harvey Show, Dr. Oz, local affiliates of NBC, FOX, CBS, and the CW, and national publications including The Washington Post and Parenting Magazine. Although a vital part of a business marketing plan, most small business owners do not have a budget for PR. Through PR for Anyone™, Daves is sharing everything she learned with regards to how to successfully pitch the media, without having to pay a publicist. “PR for Anyone™ has convinced me that reaching out to the press really isn't so difficult or scary. Nor are there gigantic hurdles standing in my way! I finally understand how, when and whom to pitch which has led to me seeing results that really mean something,” Jen Fugo, Gluten Free School. Fugo’s most recent success with PR for Anyone™ included a 12-minute segment on the Dr. Oz Show. 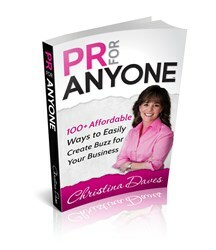 “I worked with Christina and PR for Anyone™ in refining my media pitches to attract more national coverage. In less than a month my article idea was a feature on the cover of First Magazine and I received a call from the Dr. Oz show about an upcoming episode.” Cammi Balleck, PhD. PR for Anyone™ clients have appeared on national and local television, national and local publications, radio, and top rated blogs. Learn how these businesses have found this amazing success by visiting PR for Anyone™. Resources include the book, PR for Anyone™ 100+ Affordable Ways to Easily Create Buzz for Your Business, creative strategies for headlines and story ideas, various media lists, and a 15 module PR course. 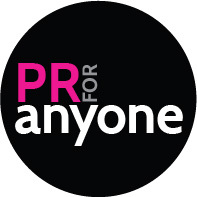 PR for Anyone™ was created to assist small business owners to easily and effectively generate their own publicity. Most small business owners can’t afford to hire a publicist and often forego this vital piece of the marketing puzzle. PR for Anyone™ teaches easy to implement formulas and timesaving techniques to help small businesses be successful in gaining media exposure.